Here’s our fantasy premier league teams GW13 article where we give our early thoughts on the FFGeek team for GW13. We look back at gameweek 12, The monitor list, transfer thoughts plus early captain thinking. So on my basic metrics a good gameweek. 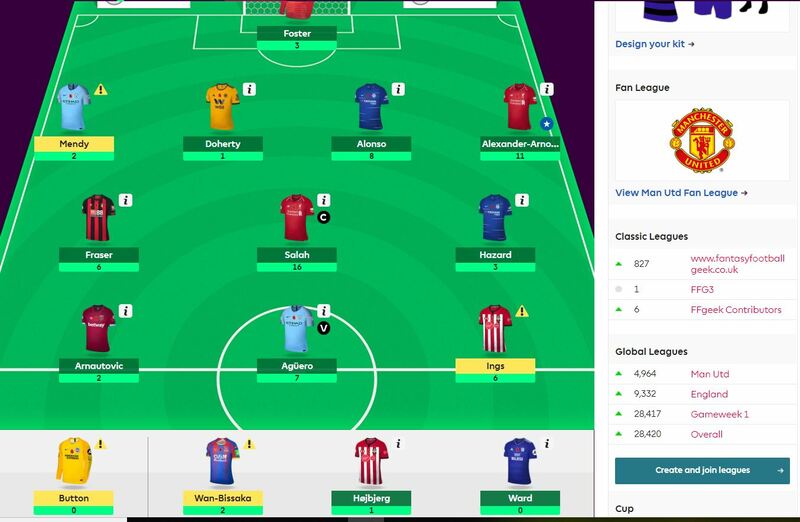 A green arrow of 11k to 28k, a 316k gameweek rank (4th best of the season), 6 returning players v a minimum requirement of 4 but only 1 double figure FPL points haul. I was travelling all Sunday so didn’t see any games so are just reviewing the stats. My transfer of Ings returned although so did similarly my 2nd choice of Jimenez. 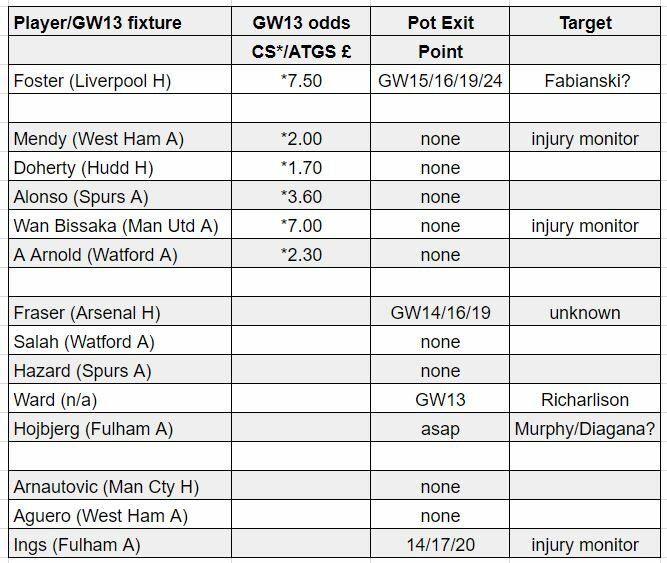 Although Ings now seems an injury doubt vs Fulham for GW13 which is about as inconvenient as you can imagine. Luck was with me with Alexander Arnold starting who also got an assist for an 11 point haul. My last minute change of Wan Bissaka to the bench instead of Doherty cost me 1 point although Doherty was only 4 minutes away from a clean sheet and it being the right decision. Probably the biggest ranking risk was Mane who was 2nd in the captain polls. He produced a 4 shot 1 key pass game although the Xg and xA was relatively low with 2 shots from outside the box and 1 of the chances inside being a headed attempt. Hazard despite blanking keeps producing the underlying stats with a 3 shot 5 key pass performance and good xG/xA. Aguero, Alonso and Fraser also returned. Fraser in the last 3 games has been producing excellent underlying stats from an assist based point of view. 3 of his next 4 games are against top 6 sides including the 2 best defences in Liverpool and Man City but I’m in no particular hurry to get him out as if I use my transfer next for Ward then I will have more flexibility in benching him for those 2 games with a stronger 13 than I have now. 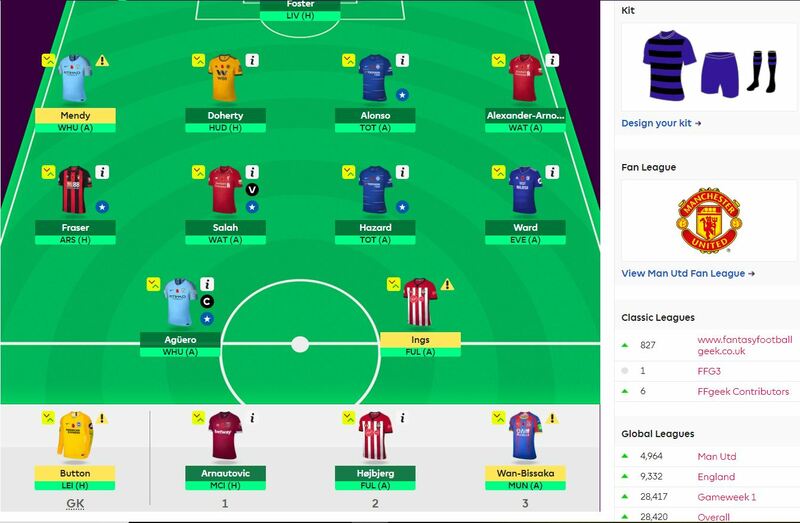 So before I talk about transfer options I have Mendy (West Ham A), Wan Bissaka (Man Utd A) and Ings (Fulham A) all mentioned as doubts on the FPL site but subject to a 75% chance of playing in GW13. That all remains to be seen. I don’t think I would transfer any of them out for a 1 game injury. Ings maybe the closest if he was out v Fulham but it’s a monitor for now. There seem to be an absolute ton of injuries going into the International break. It’s always hard to know how many are injuries of convenience or at least caution and how many are real but the end of next week will be the time when things become somewhat clearer. So with Wan Bissaka nearly out of the horrible fixture run I’ve removed him as a potential transfer out. I think him and the Palace defence have something offer after they come through that. Alexander Arnold I’ve decided to just accept as a rotation risk as he is a great price for the 2nd best defence. Fraser has a tough set of fixtures coming up but the planned transfer for Ward out for a viable midfielder would give me more bench flexibility so there’s no panic transfer out needed there especially as his form and underlying stats are good. 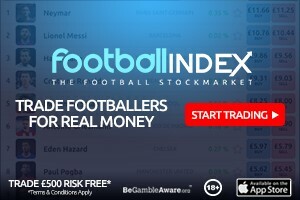 Hojbjerg I would like to upgrade to a more scoring risk of Josh Murphy of Cardiff or Diagana (if he can hold his starting place) of West Ham if the chance arrives. The small increase in cost is worth it for the points potential it gives. So the planned transfer is Ward out and Richarlison in which I currently would have £0.4m in the bank as insurance for price movements. That would give me 4 playable midfielders and more bench flexibility. Richarlison has a good fixture at home to Cardiff and is playing as a CF. He also has good underlying stats and this season has shown he can finish unlike last season. However he is an injury doubt himself despite playing v Chelsea so that needs monitoring. That planned transfer assumes I don’t have to do a reactive transfer for one of the injuries mentioned above. Jimenez for Ings would be the most likely ironically but I only have £0.1m price movement insurance for that. If that were to disappear then it would no longer be an option. I won’t be doing any transfers before Friday week irrespective. This week has the potential for your captain choice to be rank affecting with, I imagine, no clear cut favourite. Aguero is away to West Ham, Salah is at Watford. Hazard is at Spurs. It will be interesting to see how Martial home to Palace and Richarlison home to Cardiff stack up in the polls. I’m reserving judgement on who mine will be for the moment. It could take the polls and the captain article to decide this one. Poll will be later next week. A tricky week this week. 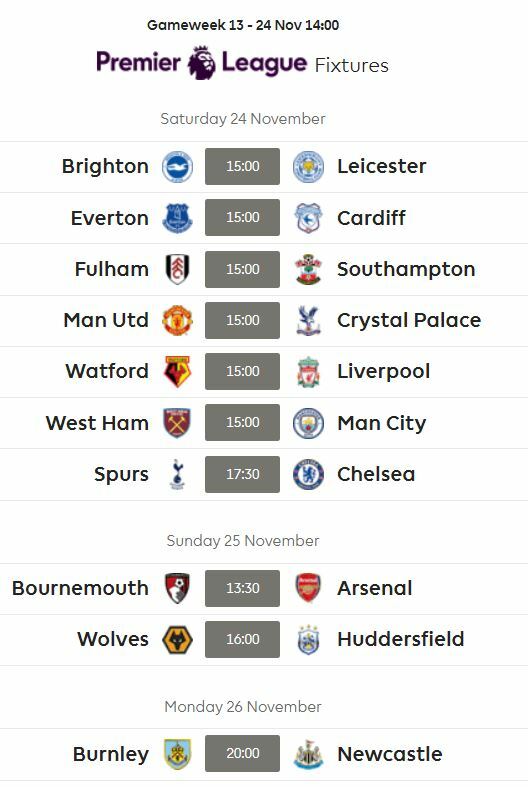 A load of difficult fixtures generally. However the difficult decision for me is the choice for the first bench spot. Should it be Arnautovic or Fraser. Injury could make the decision irrelevant. For the moment I’ve put Arnautovic on the bench but it’s not a done decision. I often think that what you gain from a strong bench you lose by not getting your bench decisions right in circumstances such as this week but overall I like the ability to have the option of a non top 6 player on the bench for a tough fixture. I’m in New Zealand staying with family for a month. It won’t affect the volume of posts. All the normal posts will still be coming out but as NZ is 12 hours or so in front of the UK, readers from there will see posts come out late at night and early in the morning as opposed to during the day. Thanks for the article as usual and I am based in Australia so it would be convinient for me about the time that the article comes. Enjoy your holiday in NZ. Thanks beast for your views. Mendy is as of now injury doubt, Patricio has 2 great fixtures coming up..that’s why I am still on hold. Overall I agree with your viewpoint that I would have to wildcard and change Mane for hazard/Dilva etc. soon but maybe I will do it after a couple of weeks. Again really appreciate you taking time out to post your reply and thanks a lot. Martial seems the real deal. Not concerned about getting him in asap? Mendy out with unknown return date, who do we transfer in ? Hey geek, please give your tips on my team buddy! Thanks buddy…good luck to you too!